Our lineup of Spring 2011 artists and projects are starting to roll out! Yay! Over the course of the next couple of weeks, we’ll present them here one at a time. Please also join us in a Storefronts Crawl through Pioneer Square and the Chinatown / International District on April 7 for a tour of all of the participants. First up here is Kristin Tollefson, a nationally-shown, well-established Seattle artist, whose public commissions dot the Pacific Northwest. Kristin’s new work, showing at 409 Maynard Avenue South, continues her exploration of the tension between the built and the natural environments. Her beautiful constructions, made from wire, mesh, and other alternative materials, recreate seed pods, branches, pips, and other lushly ornamented natural motifs. Kritstin says, “I am enchanted with the vacant storefront’s dual potential for adornment and catching passersby by surprise.” Take a walk down Maynard this week and catch yourself by surprise. 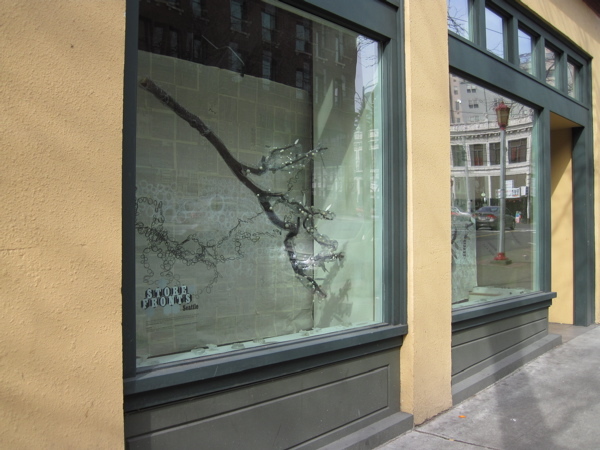 Stay tuned as we roll out the rest of Storefronts Seattle’s Spring 2011 artists! I love her work and can’t wait to see the installation!